Our roster consists of only the best in fun, fast-paced musical and comedy entertainment. Truth is, our internationally recognized entertainers have been delighting audiences of all ages for nearly twenty years. Our performers love what they do and our audiences can't get enough. Our reviews show it. No matter what team performs at your event, you are guaranteed an incredible show. Two Pianos. Two Players. One Great Time. 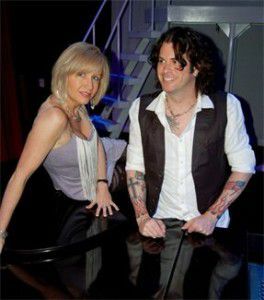 As a former Dueling Pianos Entertainment Director for 6 traditional Dueling Pianos venues located in Michigan, Alabama and Florida, Noel has trained many of today’s up and coming Duelers in the art of Sing Along. He is also responsible for creating our innovative wedding performance format. With over 2,500 Dueling Pianos performances under his belt, Noel has placed smiles on hundreds of thousands of faces from California to Japan to New York. 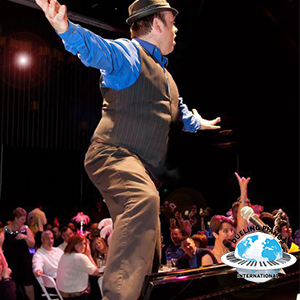 Amid the thousands of Clients, Dueling Pianos International has served, Noel is requested more than any of our other entertainers combined! In 2001, Michael became acquainted with the Dueling Pianos concept. In 2002, he decided to make this concept his livelihood and has worked in the Dueling capacity ever since. He is an exceptional Master of Ceremonies and creatively puts the finishing touches on Weddings and Fundraisers. 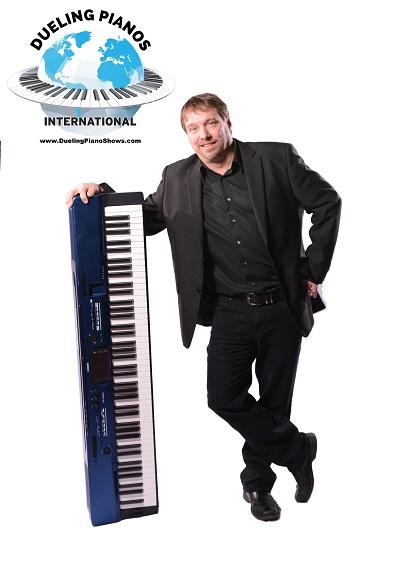 Like many of Dueling Pianos International’s other entertainers, Michael has served as and Entertainment director for 3 traditional Dueling Pianos venues and has trained many up and coming Duelers in the Midwest. 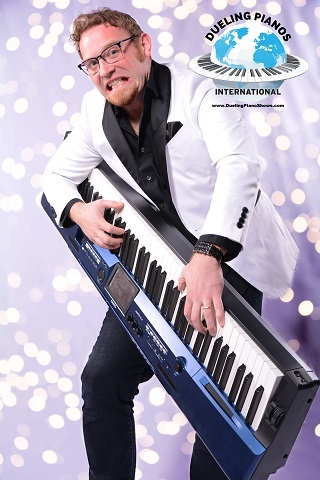 Dan is considered to be one of the funniest entertainers on the Dueling Pianos circuit. 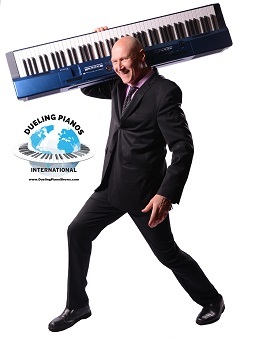 His clever and witty comedic timing along with his award-winning smile have made him one of the most sought after Entertainers on the Dueling Pianos circuit. When not on the road, Dan can be seen performing at one of many Sing Along venues in his hometown. If you are fortunate enough to have Dan perform at your next event, ask him for a CD of his comedic material. For the past 7 years, Dave Powers has been a powerful addition to our ALL STAR CAST and has enjoyed traveling the country with members of Dueling Pianos International. Dave is a two-time EMMY® Award winning composer and performer and has been a vital part of the Columbus, Ohio music scene as a pianist, keyboardist, vocalist, entertainer and educator. Dave has traveled and performed nationally and internationally. Dave is a consultant and a frequent guest of the Public Television Show “The Piano Guy” and has taught a series of master classes with “Piano Guy” host Scott Houston. Dave is also an adjunct faculty member of The Ohio State University School of Music. Considered one of the most successful musicians in the Midwest, Dave manages to win over the hearts of all who hear him perform. From concerts to clubs and restaurants to corporate events and private parties, his vast repertoire is as diverse as the audience that he entertains. Dave has performed with noted performers such as Steve Allen, George Benson, Rusty Bryant, Buddy DeFranco, Mark Farner (of Grand Funk Railroad), Eric Gales, Terry Gibbs, Ernie Krivda, Wilbert Longmire, Johnny Lytle, ‘Blue’ Lou Marini (of the Blues Brothers), Joan Rivers, Arturo Sandoval, Grover Washington, Jr. and many others. In addition, Dave is associated with the Jazz Arts Group of Columbus, and performs with the Columbus Jazz Orchestra. For the past six years, Dave has been hosting a jazz concert series at the Clintonville Woman’s Club called “The House Jazz Concert Series.” Please enjoy the following clips of Dave performing classic Dueling Pianos sing along and jazz standards. Bill has been a Dueling Pianos icon on the East Coast for well over 15 years. His innately tuned passion for entertaining people combined with his compassionate selfless nature is not only recognized by audiences across the globe, but perhaps even more so by the younger generation of Duelers on the East Coast. In one way or another, Bill has trained the vast majority of east coast duelers in the art of singalong and mastery of audience participation and is held in the highest regard by all up and coming Duelers. Bill has an incredibly busy calendar filled with Dueling Pianos performances and Elton John Impersonation appearances. His award winning Elton John show can be seen in Theatres across the country and cruise ships all over the world. 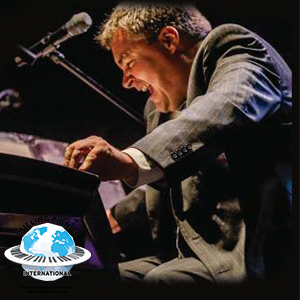 Dueling Pianos International is honored to include Bill as an ALL STAR CAST member. If you are lucky enough to secure Bill’s show for your next event, your guests are in for an unforgettable performance that will include a featured 20 minute Elton John rendition in full costume. 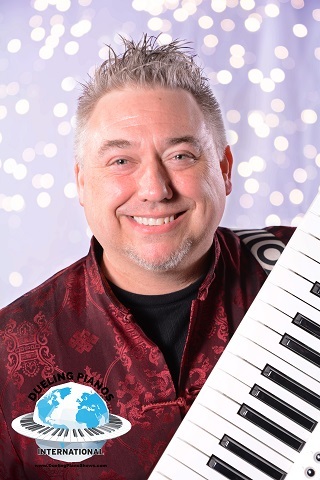 Rodney is a Dueling Pianos veteran hailing from Michigan, currently serving as Entertainment Director at 526 Main Dueling Pianos Bar in Royal Oak, MI. A comedic genius and an all around Fun Guy! Rodney's specialties are Dueling Pianos Fundraising Events, and ticketed night club events. With an incredibly large fan base in the Detroit Area, local venue owners know that Rodney always packs the house. Born in North Carolina, spending several years in Norway, performing in over 40 different countries and currently living in New Orleans, Tim is undoubtedly an “entertainer’s entertainer”. Tim has a heart of gold and enjoys performing at Fundraising Events more than anyone on DPI’s ALL STAR CAST. Tim has helped raise MILLIONS of dollars for organizations like The March of Dimes, The Tsunami Relief fund, Blind Children's fund, The American Red Cross, Raising money for children who need Kidney Transplants and The American Alzheimers Foundation! It is these fund raisers where Tim Buie set the world on fire by Attempting and Setting a few Guinness World Records for NON-STOP MARATHON piano playing! The first world record was 56 hours and 10 minutes! 2 weeks later he attempted and set another Guinness World record and getting the Official Nod and certificate at 61 hours and 3 minutes! One year later, Tim Buie performed at Rumrunners in Wilmington, North Carolina where he performed for 63 hours and 11 minutes! I was informed from Guinness that I set a new World record legitimately but, one week later Charles Brunner who resides in Trinidad surpassed Tim. But, tons of monies were raised in Tim's Efforts! Please enjoy the following Tim’s ability to entertain and leave the audience wanting more. Piano wise, Matt has entertaining crowds across the Midwest for 15 years with his interactive and engaging “audience request” format. Matt was a steady headliner at Cleveland's Howl at the Moon Saloon from 1999 to 2011 and knows hundreds of songs spanning decades. As a multi-instrumentalist and comic who plays piano, guitar, bass, drums, ukulele, harmonica and flute-a-phone(yes, the flute-a-phone from 3rd grade) Matt is a guaranteed party leader who will make your event a memorable success. Whereas his Scandinavian skin tone and chiseled upper body are often intimidating to women and men alike, don't be shy to hire this outstanding and in demand entertainer. You will not be sorry! 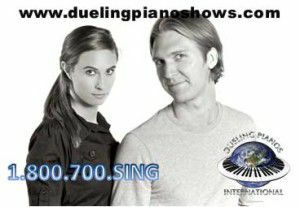 Husband and wife team Drew and Kin are available for special production and special event dueling pianos performances nationwide as well as overseas. Video available upon request. Call today: 1-800-700-S-I-N-G (7464). 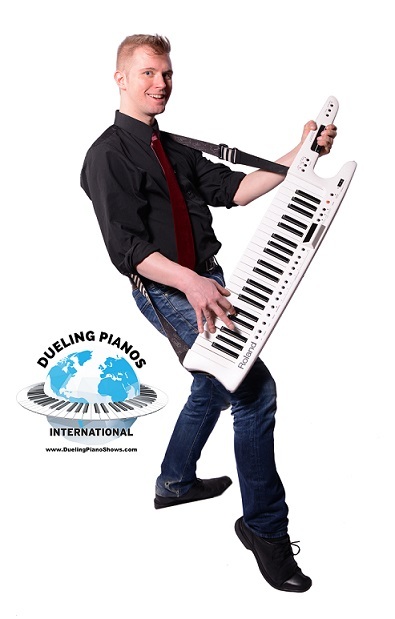 After serving in the Unites States Army, Nate fell in love with the Dueling Pianos concept in Raleigh, NC. With his Military background, Nate is obviously a favorite among our Military Purchasers and performs regularly at Fort Rucker and Fort Bragg, as well as a few other Army garrisons in the southern region. Hailing from Indianapolis, Indiana, Nate currently calls Destin, Florida his home. Aside from being a number one choice among our College Buyers, Ryan has become a favorite among our Corporate Purchasers as well as Brides and Grooms. 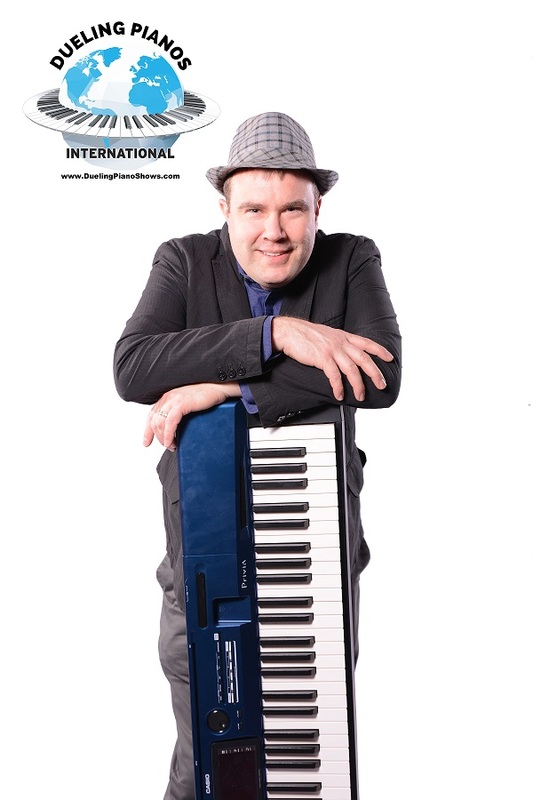 Introduced to the Dueling Pianos arena in 2005, Ryan has performed as a regular house player in 4 traditional Dueling Pianos venues and travels the Country for private events. He was recently featured on a Music Video that can be seen on Country Music Television. 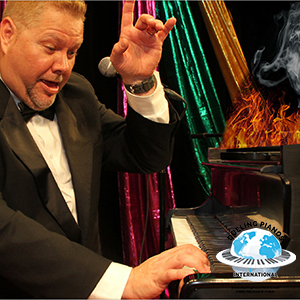 He is one of Dueling Pianos Internationals favorite entertainers. Dan Satterberg is a native of Minneapolis, Minnesota and has been a musician all of his life. He attended Berkley College of Music for a while and later completed a double major in theater and studio art from St. Cloud State. Being both classically-educated and taught by ear, Dan developed a soulful Elton-John-meets-Herbie-Hancock piano style accompanied as a clear singing voice. He’s “paid his dues” in a fair share of bands including the Prince formed and Warner Bros. signed ban. Dan became involved in Dueling Pianos as both a player and entertainment manager at clubs such as Little Ditties, City Streets, Rum Runners, and JD’s Key Club and has been a featured player as an independent contractor at various other locations. Today, Dan has a solid foundation of all the must-have sing-alongs: standard popular jazz, classic rock and country, R&B/Rap as well as any of the latest material. He performs with a commanding relaxed energy. Larry Klass hails from Fort Lauderdale / West Palm Beach, Florida and has been a Dueling Piano player since 1989. He is well known on the Dueling Piano circuit as a regular performer at such notable venues as Howl at The Moon in Cleveland, Los Angeles, San Antonio, New Orleans, and Ft. Lauderdale, Jellyrolls in Pittsburgh and Atlanta, Little Ditty’s in Baltimore and Minneapolis, Wallbanger’s of Portland (Oregon), Boogie Woogie’s in Boise, Ernie Biggs in Little Rock, Willy D’s in Fayetteville (Arkansas), The Penguin in Columbia (Missouri), Tanner’s in Kansas City (Missouri), Harrah’s in Las Vegas and Reno, New York New York Casino in Las Vegas, Sweet Caroline’s in New York City, Pete’s in Austin and Fort Worth, Bama Keys in Orange Beach (Alabama), Sing Sing in Irvine, San Diego, Denver, and Pittsburgh; The Shout House of San Diego, 88 keys, 88’s, and Hugh Jorgan’s in southern Florida, Rumrunners in Lansing and Kalamazoo (Michigan), Pub 13 in Ypsilanti (Michigan), JD’s Key Club of Pontiac (Michigan), The Reef in Boulder (Colorado), Mo Jos and The B.O.B. in Grand Rapids (Michigan), Royal Caribbean Cruise Line in Los Angeles, Longhorn Bar-B-Q in Auburn (Washington state), Carlos ‘n’ Charlies in Cancun, and Hotel Europe in Switzerland. Larry has studied piano privately in a variety of genres including classical, jazz, and pop; with concentrations on improvisation and ear training. He has had perfect pitch since the age of six. 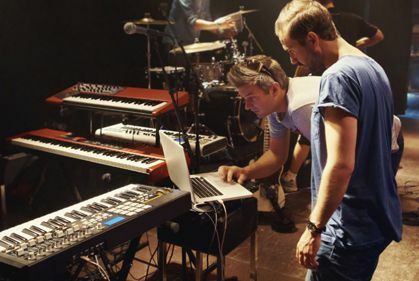 Larry has also received private popular vocal training since the age of 17. Larry has enjoyed performing alongside such widely recognized Dueling Piano players as Ken Goodwin and Kevin Clover. He boasts an ability to prevail in virtually any “Stump The Piano Player” session. He enjoys incorporating the alto sax and fiddle as part of his Dueling Piano shows. 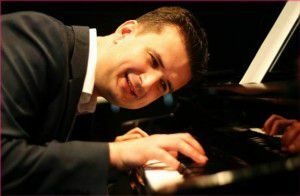 Stefan Kukurugya is a pianist/vocalist who brings smiles to all who know him, have played with him, or have witnessed his performances. Stefan has the most diverse background a musician can have: from being the touring keyboardist for the late David Ruffin of the Temptations to providing sound effects for the Detroit Symphony Orchestra; from conducting Los Angeles recording sessions to making Las Vegas appearances; from bandleader to solo and Dueling Pianos. Stefan's abilities and scope appear endless. His projects also include several New-Age album releases, children’s recordings and soundtracks for interactive CDs. Bob McGrath of “Sesame Street& was elated to have Stefan onstage, as was Rory Zuckerman of The Learning Channel. When Stefan isn't writing, performing, producing and directing, you can see him regularly on television promoting the Michigan Lottery. Just look for his trademark beret. Tim serves as the Ultimate Compliment to each of the Artists on our Roster and knows this "ins and outs" of everyone's performance. 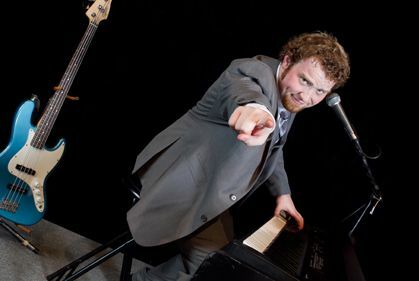 His altruistic approach to the Dueling Pianos "team" concept makes Tim a preferred partner for the majority of Dueling Pianos Internatonal's roster. 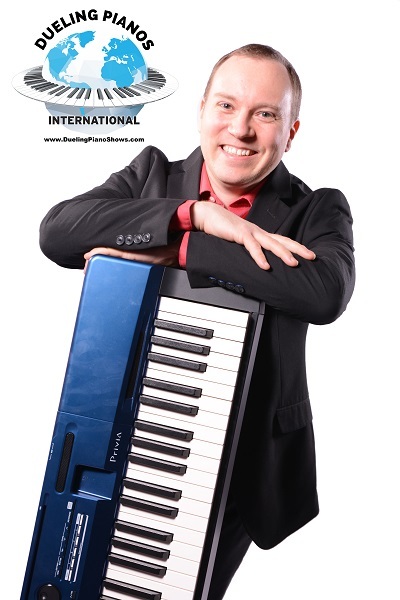 When Tim is not traveling the country with Dueling Pianos International, he Currently serves as the Entertainment Director for a popular Dueling Pianos venue in Traverse City Michigan. When you see Tim's show, you'll be smiling even bigger than he is smiling in the above picture.